Long-time heavy alcohol consumption can have many effects on the drinker's system, including cognition, emotion, reward, immune function, and energy utilization. When chronic heavy drinkers are intoxicated — and when they are withdrawing from alcohol intoxication — they can experience mood swings, diminished cognitive abilities, memory loss, and a decreased ability to learn. Some research has found that heavy alcohol consumption can begin to cause negative health effects on the body after only several weeks or a few months of drinking. It's not just long-term drinkers who can develop these symptoms, but also those who drink heavily for a relatively short period of time. What is not clear is exactly how heavy alcohol consumption can affect so many systems of the body — from brain function to the immune system to the digestive system. One theory about how alcohol causes these effects is that heavy alcohol consumption produces an increase in cortisol, also known as a "stress hormone." Cortisol is produced by the adrenal glands and its the body's primary glucocorticoid. The body naturally produces more cortisol when you are affected by stressors such as fear or anxiety. It's part of the body's stress-response system. Short-term, stress-induced cortisol can increase blood pressure, focus alertness and attention, a longer term can adversely impact some body functions such as bone growth, digestion, reproduction and wound repair. Cortisol also plays an important role in regulating the body's immune, reward, cognition, and emotion systems, as well as cause sleep disruption. Research has found that alcohol consumption also increases the body's production of cortisol, not only while the person is intoxicated, but also when the drinker is withdrawing from the effects of intoxication. 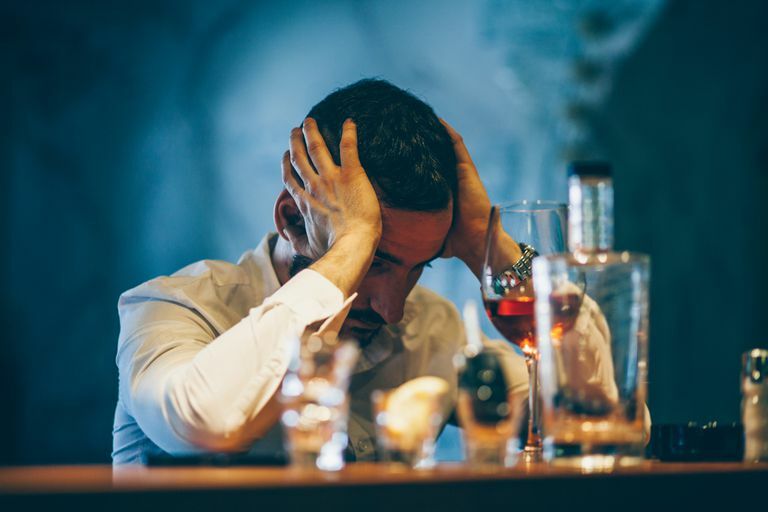 Researchers believe that a high level of intoxication can cause a state of general stress, which can stimulate cortisol release and suddenly stopping alcohol consumption can cause an even higher level of stress for the drinker. It is also thought that alcohol could affect brain chemicals that signal the adrenal glands to produce more cortisol. To test these theories, researchers at the Veterans Affairs North Texas Health Care System in Dallas recorded the breath alcohol concentrations and cortisol levels of 73 alcohol-dependent patients and 22 alcohol-dependent patients who were abstinent and participating in a residential treatment program. Because 38 of the 73 alcohol-dependent patients who were seeking treatment were intoxicated and 30 were not intoxicated, but going through withdrawal, the researchers were able to compare the three groups. Using saliva tests, the patients were checked for cortisol levels. The study found that both the intoxicated group and the withdrawal group had increased cortisol levels compared to the abstinent group and that the cortisol concentrations actually increased during the progression from intoxication to withdrawal. The study confirmed that cortisol does remain elevated throughout the drinking cycle, not just during intoxication. The researchers, led by professor Bryon H. Adinoff, were quick to point out that research has not yet shown that cortisol is responsible for the medical and psychiatric problems associated with heavy drinking, but could very well cause costly wear and tear on the body resulting in significant damage to the central nervous system and peripheral organs. They believe future studies should explore how increased cortisol levels affect sleep disruption, cognitive deficits, diabetes and mood disturbances in alcoholics. The study authors conclude that it may be important to decrease cortisol levels during both chronic drinking and withdrawal to protect the health of the alcoholic patient. Adinoff, B, et al. "Increased Salivary Cortisol Concentrations During Chronic Alcohol Intoxication in a Naturalistic Clinical Sample of Men." Alcoholism: Clinical & Experimental Research September 2003. Miller-Keane Encyclopedia and Dictionary of Medicine, Nursing, and Allied Health " glucocorticoid." Seventh Edition 2003.